Windshield wipers will help keep your visibility the best it can be this summer. Without windshield wipers, you will not have proper visibility. They are designed to push away any precipitation, road grime, or debris that might be on your windshield. If you do not have the proper wipers for your vehicle, your visibility will decrease and your safety will be compromised. Make sure to have them replaced when it is recommended. We can also advise you on how often this should be. If they start to show signs of wear and tear and other damage, make sure to replace them. This can help to ensure that you will have the best visibility possible when you drive. If you notice that the windshield wipers are damaged, there might be signs you will see. They could chatter or streak across the windshield as they operate. If this is occurring, they should be replaced as soon as possible. This is especially true if you notice the wipers are not cleaning the windshield fully and completely. Since there are several different kinds that are options for you to purchase, we can recommend the ones that would be best for your vehicle. The wipers will have to be installed correctly as well. If they are not on correctly, they will not work properly. 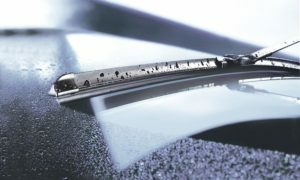 If you have a rear windshield wiper, make sure to have that one replaced as well. Even if you do not use it often, it can still be dried out and become brittle from the everyday elements. Also remember to top off the windshield wiper fluid in the vehicle. This fluid helps the wipers to clean the windshield more effectively. Without the washer fluid, the windshield is more difficult to clear. If you notice you have to replace it more often, there could be a sign of a leak in the vehicle. Make sure to bring the vehicle in so we can inspect it for you. If there is an issue we can also repair it as soon as possible. This can help you to have a reliable vehicle.